But, anyway – wish granted! *Disclaimer: The following video, while demonstrating some insanely cool tech, may bore you to tears. In response to reader requests, we feel it’s important to warn you. That said, let’s talk about just how much this is like Woody Allen’s sci-fi parody classic Sleeper. Not only did Woody Allen’s character get strangely high with a large sphere, but the movie even suggested how to productize a more portable version of the sphere, as seen at right. 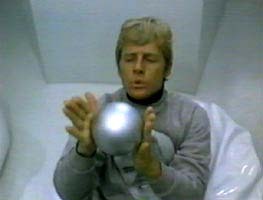 Microsoft Sphere Nano, anyone? And it’s back to the future in other ways, too. 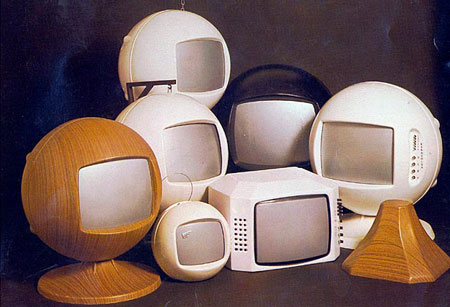 Ironically, I think these 1968 designs look far more stylish and futuristic than Microsoft’s Sphere. So, sorry, Microsoft. The future just isn’t what it used to be. Even Woody Allen’s future. And he was kidding. Are You VJing Live With Processing?